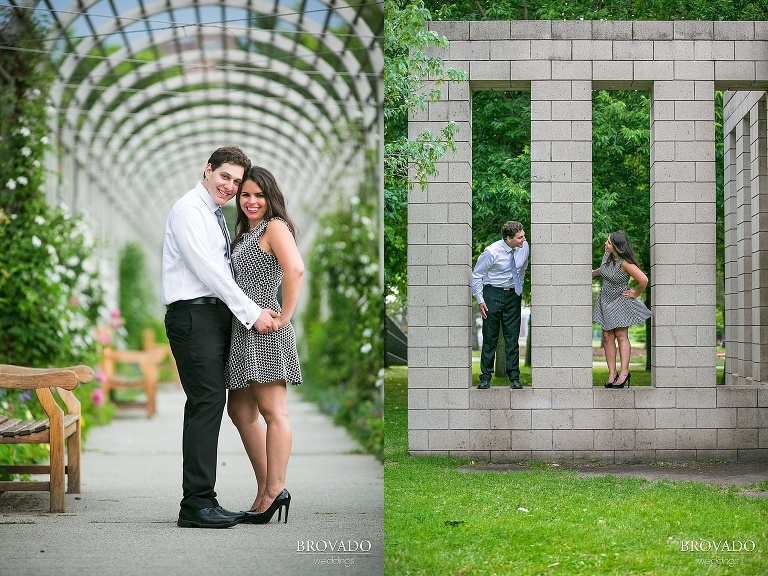 The Walker Art Center Sculpture Garden near downtown Minneapolis is an awesome location for Minnesota engagement photography. Alicia and Brady wanted some engagement pictures taken in front of the iconic “Spoonbridge and Cherry” (an obligatory shot for any Minnesota native). I especially love the photos we took on the beautiful Irene Hixon Whitney Bridge (although, locals generally refer to it as the “Walker Bridge” or the “Loring Greenway Bridge.” In fact, it’s real name is not at all well-known! I hope you learned something new today…) that hangs over “spaghetti junction” (sixteen lanes of streets and highways, merging together into one big, huge, but surprisingly congestion-free mess between the Walker Art Center and Loring Park) because of the cool vortex effect made by the geometric structure. Love that bridge… Anyway, congratulations, Alicia and Brady! I can’t wait to photograph your wedding!